We observed Lincoln's 201st birthday here at the Hadley-Ives household by spending a couple hours sledding. We built a ramp at the bottom of a steep hill on the public golf course here in town (which has one of the very few hills in this area of glacier-flattened central Illinois). I went over it a couple times, and I'm now feeling rather sore. I spent about an hour this evening reading poetry about Lincoln, and then I decided to make a web page collecting some of my favorite old (copyright-expired) poems. I spent much of the day reading student papers in my classes, and I'll probably spend most of tomorrow afternoon writing feedback for them and updating web pages for the classes. I did my federal taxes last night. Once again our contribution to the federal government through income taxes will be around $1,500. That doesn't seem like much. 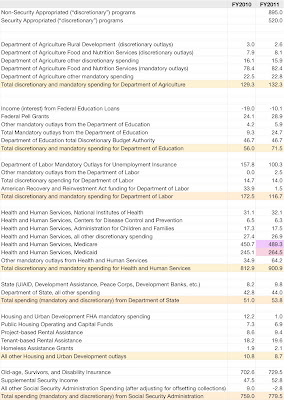 Anywhere, here is where the money goes if Obama's proposed FY 2011 budget is approved. We should get about 8 centimeters of snow tonight, and maybe another 6-8 centimeters on Tuesday and Tuesday night. We already have some snow on the ground, so this should be good. Temperatures won't get above zero (Celsius) for five or six days at least, so the sledding should be great. On Saturday night I took my sons and some of their friends sledding at the local park here in Springfield, and the snow was very hard and slick, with some powdery snow on top, and this made the sleds tear down the hill at incredible speeds. I think we probably exceeded 40 kmh, or even 50 kmh. I'm looking forward to some more sledding this week. Other than that, I'm mainly working on my classes. I've posted a couple blogs on my policy class blog related to the White House proposed budget and a report on welfare spending. Today I voted in an Illinois primary election. In Illinois you must ask for a particular party's primary ballot. I had a choice of Republican, Democratic, or Green ballots, and it was difficult to make up my mind. I have some opinions about the Democratic candidates for governor and senate, and so I was tempted to vote on the Democratic Party ballot, but then there are several other contested races where I hadn't done any work to investigate the candidates, so I would have left many choices blank. Likewise in the Republican races there were a couple candidates I would have wanted to vote against, but I generally knew very little about most of the Republican candidates, aside from one who is a personal friend (and running uncontested) and another I like who is going to win her primary easily anyway. So, I took a Green Party ballot. I'm very happy about the Green Party's senate candidate LeAlan M. Jones. Also, it was easier and faster to vote on the Green Party ballot, because none of the positions were contested, and there were many offices where no Green Party person was running. I checked out my county clerk's election results (Sangamon County Election Results). It appears that 92 other persons in this county took Green primary ballots as I did. That is only 0.41% of all the persons who voted in the primary election, the numbers are probably low because the Democratic and Republican parties have interesting contested elections, and on the Green Party Ballot all you could do was confirm that you supported the uncontested candidates (or just not vote for some of them, if you only supported some Green candidates -- the Greens have put some fairly flaky people to stand for elections before). I'm the only person in my precinct who took a Green primary ballot, and the precinct across the street from me didn't have anyone take a Green ballot. But at least 93 of us in the county did, so that's comforting to know. Some of my coreligionists (Baha'is) don't vote in Illinois primaries because you must ask for a particular party's ballot or else ask for a nonpartisan ballot (and there was nothing on the nonpartisan ballot today). Baha'is aren't supposed to become involved in partisan political party politics. Well, I'm an independent voter and I've never actually joined a political party. Taking a party's primary ballot doesn't mean one is a member or partisan supporter of that party. I think we all have a duty to be involved in elections and political discussions. We just must do so with our allegiances to basic principles and ethical motives, rather than agendas to help a particular political party gain more power. 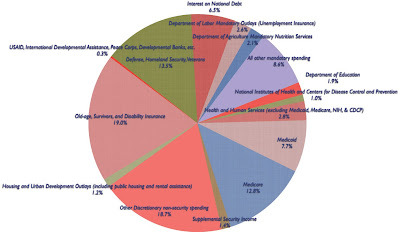 I've been studying the proposed FY 2011 budget released by the White House today. 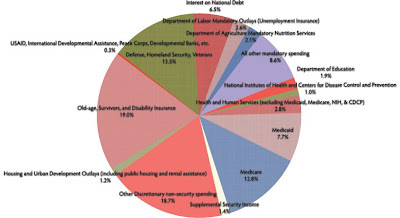 I created this pie chart to show where the money is going. The three things I like least about the budget are: 1) there is no projection into the future where the budget ever gets balanced; and 2) security spending is still about 13% of federal spending, which is about twice as high as it needs to be; and 3) meaningful foreign aid to reduce poverty remains a trivial part of the budget. The things I like about this budget are: 1) it increases spending on education, including a provision for a large increase in Federal Pell Grants; and 2) The National Institutes of Health will get a slight increase (in FY 2010 there is a proposed budget for $31.1 billion, and in FY 2011 the NIH get $32.1 billion). I like the optimism in the projection that unemployment benefits paid out to those getting unemployment insurance will be only $158 billion in FY 2010 and then drop way down to $100 billion in FY 2011. I hope we really do experience that. I wonder about this optimistic picture, because with mandatory outlays for the Department of Agriculture's Food and Nutrition Service the FY 2010 projection is $78.4 billion and the FY 2011 projection is $82.4 billion.